The team behind Buzz! 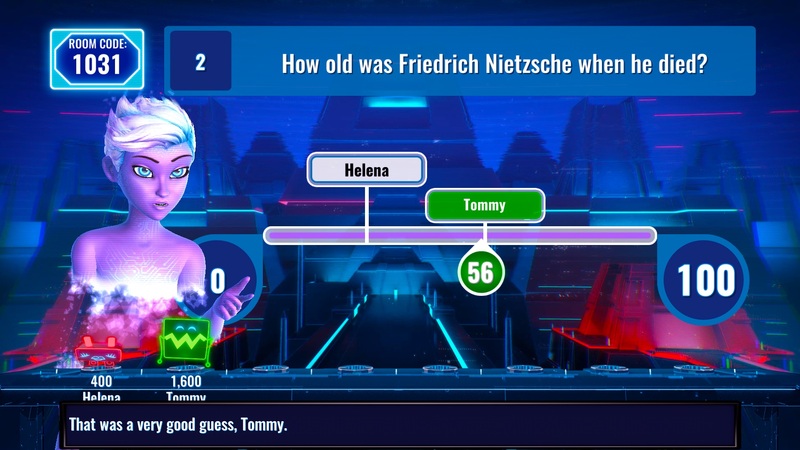 returns with an all-new trivia game. But does it hold up to the legacy of their past work? Our review. New studio SnapFingerClick may not sound familiar to most people, but trivia buffs that owned a PlayStation 3 may recognize their work. This is the team behind the classic Buzz! games and, having gone independent, the team is now trying their hand at a new trivia game for a new generation. It's Quiz Time offers up a massive array of questions from over 4,000 categories. With over 28,000 individual questions, this should definitely be one of the more fun trivia game experiences. But there's something about the presentation that leaves this game feeling a bit wanting, particularly with the game's host. One would imagine that the console version of It's Quiz Time would work with gamepads, but this does not prove to be the case. No, to begin a game session, up to eight players can jump in with their iOS or Android devices. This will act as the players' buzzer, as well as their second screen. This isn't the first time I've played a quiz game in this manner, but it is one of the most responsive. There was zero lag to speak of and the app interface allowed for twitchy responses and quick strikes. Questions are mainly multiple choice, but there are certain other round types, like Describe It. This has one player attempt to describe a certain subject out loud to everyone in the room, while the other players cross off any of the keywords mentioned. There's also Guesstimation, which asks for the closest numerical answer and utilizes a slider that can be adjusted with the smartphone's touch screen. Trust or Bust is the other standout round type, because it not only tasks a player with getting a question right, but it also tasks a second player with guessing whether that first player will answer correctly. It's a chance for two players to earn points and is a really cool idea for multiple-person games, though it doesn't quite work so well for one-on-one games. The questions have a healthy variety to them, ranging from urbane pop culture to focused corners of academia. The only issue I noticed is that there's an occasional tendency for questions to repeat themselves. By that, I mean that there have been instances where I'd get a question like "Sephiroth was featured in which role-playing game?" and then see "Final Fantasy VII featured which character?" in the exact same round. That wasn't a frequent issue, but it's one that I feel is worth mentioning, because it can come across as cheesy to anyone in the room who's playing for the first time. 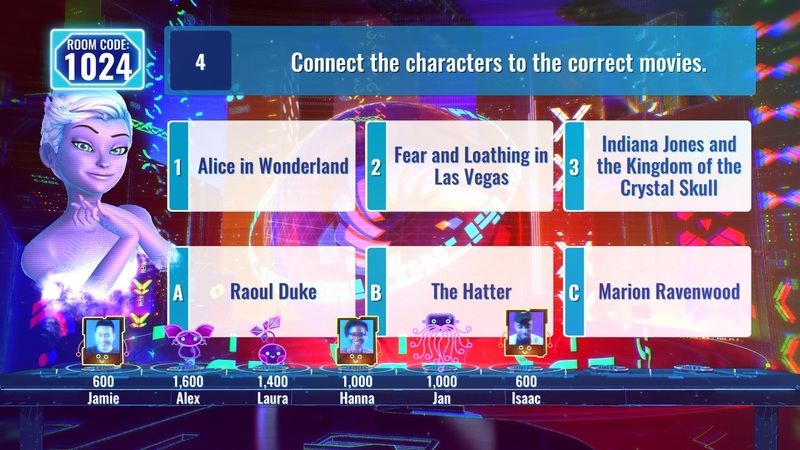 It's Quiz Time also captures the proper intensity of what a trivia game's final round should be. It's an onslaught of rapid-fire questions that reward quick correct answers, while subtracting points from wrong ones, out of a potpourri of categories. By the time the game is over, the format proves to be a good time for all. It's even enough to overlook a few certain issues with the presentation. There's one face that It's Quiz Time players will familiarize themselves with over the hours they spend with the game. That's Salli, the game's AI host. In certain respects, Salli is a pretty cool advancement on the concept of an AI game show host. Games start with players creating their profiles on their smartphones. They can take selfies to use as in-game icons and also enter their names. What's eye-opening about this aspect of the game is that Salli will pronounce the name entered to the best of her ability. And even if she can't necessarily pronounce a player's name, the player will have an opportunity to correct her pronunciation through the app. It's a degree of personalization that I haven't seen in this type of game before and it's a welcome addition. It does falter a bit in the solo mode when playing with a DualShock, because she'll insist on spelling out your handle, one letter at a time... every time. The issue with Salli is almost everything else. While Salli is willing to learn about her players, she isn't learning much in the way of personality. She drones on with a near monosyllabic, robotic tone that brings across a sense of monotony. While I understand that fake enthusiasm can create a different set of issues, Salli's robotic hosting quickly starts to feel draining. The little personality she does express ranges from forced banter to outright creepiness. Every time she tents her fingers, I feel like she's trying to burn my soul to a crisp. 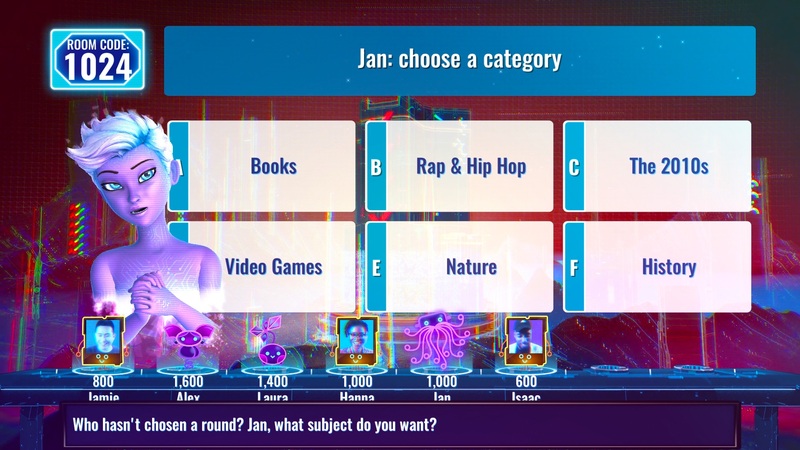 One issue I have with It's Quiz Time is that for as much as it's connected to the online space, there is no traditional online multiplayer. Friends have to gather locally in order to test each other's wits. Given the variety of what this game can offer, I feel like it's selling itself short by restricting itself in that way. However, there is one other way to play with other people and that's through a Live Show option. This allows people on either YouTube or Twitch to livestream their session and compete against audiences as a whole. Answering questions is as simple as engaging in Twitch or YouTube's chat functions. Viewers are judged as a tandem and it essentially turns into a one-on-one game. It's a cool way to engage audiences and, having been on the chat side of this equation, it's a nice interactive feature. Tell 'Em What They've Won! It's Quiz Time has some first season growing pains. Salli as a host doesn't quite work as well as she should, even if her personalization efforts are top-notch. Her robotic presentation starts to feel like an overwhelming negative at times and her repetitive mannerisms don't help. But aside from its robotic hostess, It's Quiz Time is as robust a trivia game as a person can find on the next-gen market. The rich variety of questions makes this a fun game to return to on a regular basis and some of the inventive round types makes this even more fun to play with groups of people. This has the potential to be every bit the fun party game that Buzz! once was, but just remember that the more, the merrier. This review is based on a PlayStation 4 digital copy provided by the developer. It's Quiz Time is available on the PlayStation Store for $19.99 and is coming soon to Xbox One and PC. The game is rated E.